The Ottawa Senators are coming off a summer in which they spent $15M enhancing the fan experience at Canadian Tire Centre... and they're not done yet. Tonight, the Senators will once again up the entertainment ante when they add a new contender to their much-beloved Prime Ministers' race: the Right Honourable Stephen Harper. "We're really excited to be able to introduce Stephen tonight," Senators' President Cyril Leeder explains, "Voter turnout skyrocketed during the recent election, and the Ottawa numbers were particularly impressive. This tells us that people were right. Ottawa is a government town. And we're hoping to capitalize on our fanbase's desperation for even the slightest bit of entertainment." 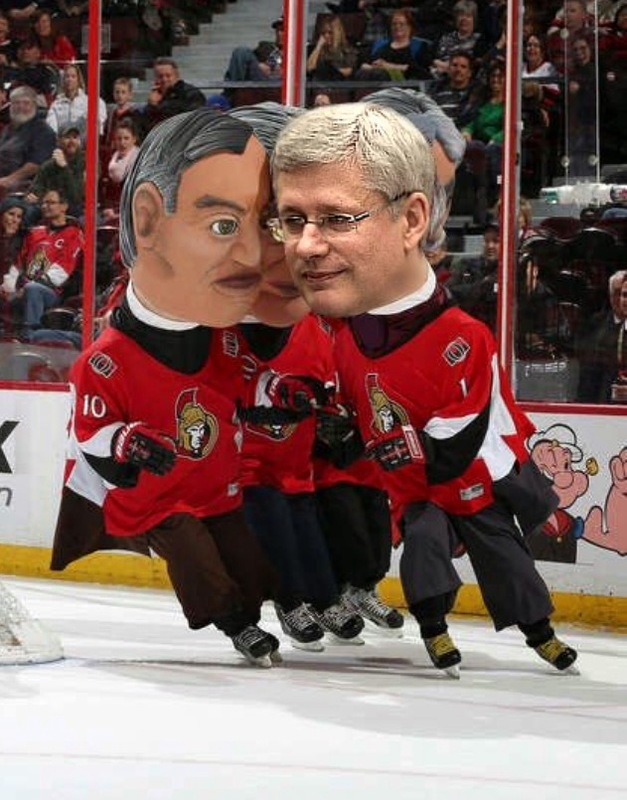 It was in that spirit that the Senators debuted a quartet of new mascots last season, each bearing a likeness to a former Prime Minister. At home games, Sir John A. Macdonald, Sir Wilfred Laurier, Sir Robert Borden, and William Lyon Mackenzie King all take part in races that feature big hits, wild spills, and looks of confusion from everyone in the audience. "We really try to refrain from discussing politics here, but I can tell you honestly that we were thrilled with the outcome of the election," Leeder admitted. "Right around the time that Harper decided to base his campaign around telling citizens of a first-world country what they could and could not wear, I looked at Bryan and said 'we're getting ourselves a new former PM'." It hasn't been easy for the Sens to integrate their Harper into the action though, and a series of incidents have left some with the impression that he's just not ready. "I can understand people being nervous and I'll be the first to admit that he's done some troubling things... he tried to sign some pretty bad trade deals, he wanted to let someone route oil right across our precious ice surface... but we sent a strong message that we weren't okay with that, and I think he finally gets it." If you're attending the game tonight, you can look forward to Harper making his debut alongside the other former Prime Ministers during the second intermission.